Two years ago, I was looking for my next thing. I had a run a company for 5 years as a startup founder and then CEO of a consultancy. I had finished a longer term consulting assignment for several months. I wanted to get back into making products again. I looked around and the one thing that was top of my mind was “Where can I learn the most?”. Where could I learn to become a great product manager? I didn’t care as much about the pay but what was more important was optimizing for learning opportunities. I thought more about who I could learn from, their reputation in making products, and the actual products themselves. I felt that I needed to be around other great product managers and an organization that had a product management discipline. Atlassian had the biggest number of product managers in Australia and their products are known worldwide. So it was an easy decision for me to make and there were #1 on my list of companies to join. When I had the opportunity to come to the US to Silicon Valley, my manager in Sydney asked “Would you be interested in working in our Mountain View office?”. I said “Yes” immediately. I had decided that I wanted to go before the end of the meeting. My reasoning was the same as when I decided to accept the job offer to join the company initially. It was “where could I learn the most“? I felt that the biggest learning opportunity for me was in the U.S. My luck surface area or more accurately my “learning surface area” was going to be greatest in San Francisco Bay Area. If you work in tech, its a great place to work in. This is because its an environment that attracts the best and brightest from around the world. The type of people that you work with and hang out with socially is an incredible opportunity as I’m from Australia. I believed that I could learn from them. If I look back at the last few weeks, I’ve probably met about 25 new people. They range from people that work at large tech companies such as FANG (Facebook, Amazon, Netflix, Google) to mid size companies like Strava to fledging startups. I live in Mountain View so a lot of the people I meet are from Google. They could be working on Google Maps, Android, Chrome, Next Billion Users, Hangouts, or Advertising. My neighbors work at Apple as engineers. I also have contacts at Apple through other social circles. My previous room mate use to work on self driving cars at Cruise. I’ve met other people that work at other self driving car companies. In the last hackathon, I worked on a voice app. We used Google Home as we were more familiar with it than Alexa. That same weekend I met someone at a social event that works on Alexa. He was willing to help me learn how it works. I was at a cafe earlier today where I was with some engineers at Google who were debating about they could improve their engineering practices. This helped me build more empathy for the engineering discipline and with the engineers in my team. At work, I’m a buddy for someone that was previously in a management role at Facebook. I’m mentoring him, but he’s also teaching me. The kind of access to people who have expertise in working on big problems and solving problems at scale is incredible. I’ve found that they’re all down to earth people and very approachable. 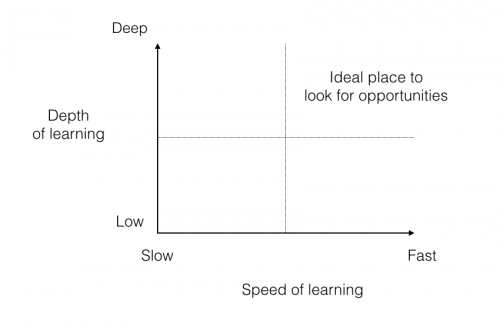 I’ve come to realize that there’s learning on two axis. One is depth of learning (how much can I learn) and the rate at which you learn (how fast can I learn). Depth: How much can I learn? In Silicon Valley, they’re working on unique & big problems. There’s also a concentration of companies in a one hour drive from SF to San Jose all working on tech. From biotech to hardware to software. There is an intense concentration of the tech industry. These people have done things that I haven’t done before. They can teach me things that I don’t know. I can learn from their experience. The depth of knowledge of tech & running tech businesses is much greater there. This is because these folks have been doing this for a while. Its meeting a seasoned veteran who has been in a similar situation and can relate to you. They have stories about the past. Some of these folks have been working in tech like 20+ years. Australia simply hasn’t done that many laps. We’ve been through like 1 decade. They’ve been through many loops and have lessons to share. Some of my co-workers were here when the internet was created and when the boom & bust happened. Some have worked at earlier companies like Netscape or when Amazon started. There is so much transfer of knowledge that happens here. I believe that is because people here are constantly trying to solve big problems e.g. self driving cars, scaling to a billion users, VR, voice. The depth of the problems is bigger, experience level is deeper, hence my opportunity for learning is bigger. So I consider this key question “How much can I learn?”. Speed: How fast can I learn? One thing you notice about Silicon Valley is speed. I remember doing an AMA with Mick Johnson who was quoting another Aussie based in Silicon Valley, Ryan Junee who believes that the key startup metric is “your rate of learning”. If you’re able to learn quickly, you have a higher opportunity to overcome a problem and be successful. The speed of response and execution is much faster here. A case in point, our Mountain View office went from 1 to 150 people in two years. We’ve moved office location two times as we outgrew each physical location. I saw how existing processes broke and how we had to adapt. I haven’t experienced or seen anything like that in Sydney. I look at the speed at which things work and I feel like the startup vibe is infectious here. I was here when there was roughly 70 people and now its doubled in size in one year. Overall, I’m also seeing how the company reorganizes itself as it breaks through each mould. There’s a sense of urgency and quick turnaround that I have noticed. I believe its because people here understand the rate of learning and the need to move fast. They know how to prioritize and execute efficiently. I love it because I agree with that. Startups and high growth tech companies need to move fast. There’s a sense of GSD here. They’ve also seen the disruption happen to other tech companies. So the next important question I consider is “How fast can I learn?”. For me the ideal learning opportunities are where you have depth (lots to learn) and where there is a fast rate of learning. This is what it looks like when mapped out below. Its the upper right quadrant you want to be in. When I watched Jiro, its clear that this guy is a master of his craft. He’s 85 years old and been making sushi all his life. He has the only sushi restaurant that’s been given 3 Michelin stars. He admits that there’s no special techniques that he’s used or things that people can’t copy. He simply does it better than anyone else. Its constant practice and refinement. His state of mind is Jedi level. Even though he’s top of his game, he’s constantly saying “I still have much to learn. I can always get better”. His respect of the craft is unparalleled. Its an endless pursuit of perfection. A next level craftmanship. I feel that for myself, I need to have the same mindset. There’s so much for me to learn about making products and becoming a great leader. I’ve gone to the place where I feel like I could learn the most in terms of depth and speed. I’ve come to the product mecca to learn. I don’t care as much about money as long as long as I can live comfortably and can save it. Its the pursuit of the product craft thats most important. That’s why I held meetups at my house where I would bring together product managers to share about what we do and how we can get better. Its why I read up constantly and write about making products. Its why I hold a lunch time gathering at work for product managers to discuss product craft. Its why I believe that the key is to simply make awesome products that people love to use. The only way to get there is to keep making products, over and over again. Like how Jiro keeps making the sushi in the pursuit of perfection. It blew my mind when they said an employee had been there 10 years as an apprentice and still had much to learn. Another younger apprentice had to spend months making the special egg sushi. He’d keep making it every day. Jiro and his son kept saying it wasn’t good enough. They had a really high quality bar. It took him several months to get to the point where they said it was acceptable. Then he broke down and cried. Crazy! I was really inspired by the Jiro movie.